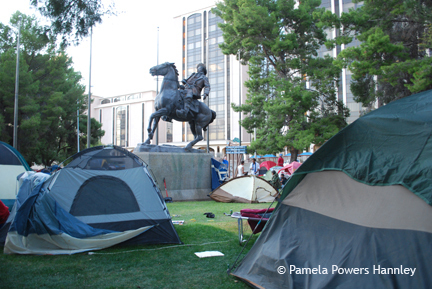 Occupy Tucson encampment at Veinte de Agosto Park. If your first amendment rights are important to you, you should start watching the Tucson City Council agendas very closely. Embarrassed by the Safe Park quagmire and the subsequent scolding by the district court judge, City Attorney Mike Rankin wants to crack down … on them and on us. Ordiance Prohibiting Camping or City Sidewalks and Other City Property (PDF) seeks to prevent another Safe Park or Occupy Tucson from happening. The memo clearly states that “homelessness is not a crime, and only the conduct of camping, and not the state of homelessness, is prohibited by the Code.” So, where are the homeless supposed to go when there aren’t enough beds in shelters? Are they supposed to camp or sleep on private property– like one of those cute front yards in Armory Park? By early this morning, the Facebook protest event against the “Crowd Management Event” ordinance had close to 100 attendees who said they would protest at the Ronstadt Center beginning at 5 p.m. on Monday, March 16 (today). Less than one hour before the protest, the Tucson Sentinel posted a story saying that the “Crowd Management Event” ordinance had been pulled from the March 17 meeting agenda, but the urban camping ban is still a go. The Sentinel quotes a memo from Rankin stating that the item was pulled for now but could reappear in the future. Pay attention. 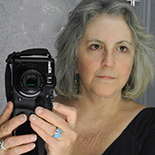 This entry was posted on March 16, 2015 by Pamela Powers Hannley in Arizona, City Council, democracy, downtown, Free Speech, Homeless, jobs, Occupy, organizing, Tucson and tagged homeless, Mike Rankin, Tucson.